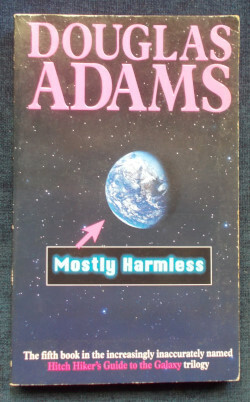 The fifth book in the ever-increasingly inaccurately named Hitchhiker’s Guide to the Galaxy trilogy. It’s very easy to get disheartened when your planet has been blown up, the woman you love has vanished in a misunderstanding about the nature of space/time and the spaceship you are on crashes in flames on a remote and Bob-fearing planet, and all you have to fall back on are a few simple sandwich-making skills. But instead of being disheartened, Arthur Dent makes the mistake of starting to enjoy life a bit and immediately all hell breaks loose. There is the usual Ford Prefect hell; a hellish new version of the Hitchhiker’s Guide to the Galaxy that behaves in a sinister, mysterious and airborne manner; and the unexpected hell of the arrival of a teenage girl who is Arthur’s daughter – who he didn’t know he had! Author: Douglas Adams. Category: Sci-Fi/UFO. Tags: NO spine creases, Paperback in good condition, Tightly bound and clean within, Very faint edgewear.